Green tea is well-known for its healing and anti-oxidant properties, and now Lipton makes it easy to grab a bottle of tea at your local convenience store. In our health-conscious world, you may wonder if the benefits outweigh the risks of most foods and beverages. 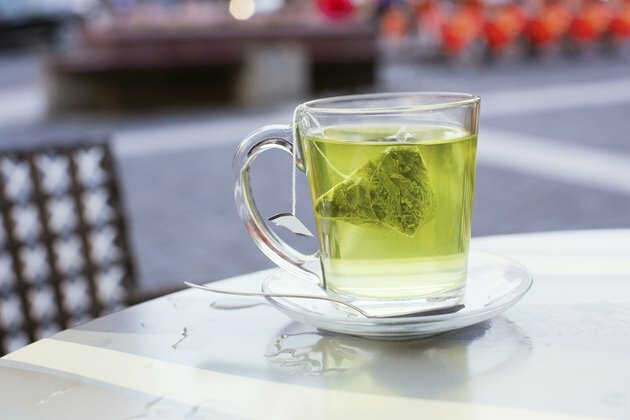 While green tea does have some possible side effects, they are minor and easily preventable. Lipton's Green Tea is similar to other teas and should not cause any unusual side effects. All teas contain about half the caffeine found in coffee. Still, for those sensitive to caffeine, this can be a problem. Watch for signs of restlessness, sleeplessness, heart palpitations or tremors. Cut back if you have symptoms that are bothersome. On the other hand, small amounts of caffeine may be good for you, and the caffeine in tea is metabolized differently than the caffeine in coffee. While coffee gives you a quick buzz, tea's effect is spread out over time and gives you a gentle lift instead. This could be a positive side effect of Lipton Green Tea. If you have a sensitive stomach, you may experience an increase in gastric acid. This can cause stomach pain and heartburn. Again, moderation is key. Reduce your intake of green tea if you experience problems. Drinking too much green tea has been shown to be a cause of neural tube defects in unborn children because of the caffeine, tannic acid and catechins in the tea. Some tea may be OK; large amounts may be dangerous. If you are concerned, it may be best to cut out green tea drinking altogether. Green tea blocks the absorption of some nutrients, including iron. However, there is some evidence that heavy tea drinkers develop heavier parotic glands that neutralize the effects of the tea tannins. If you want your children bouncing around the house, let them drink tea. If you prefer them less stimulated, try some healthy juice without added caffeine or sugar. In addition, the tannins in tea may block the absorption of proteins, fats and other nutrients in young children. While Lipton Green Tea is no different from most other green teas in its pure form, the tea bag, it is used in products that are not healthy. Lipton Iced Green Tea has 200 calories, mostly from high fructose corn syrup. In this respect, it's no better for you than the average bottle of soda pop. If you want to grab a bottle of Lipton Green Tea, make sure you drink it without the sugar unless you want a healthy boost of empty calories along with your anti-oxidants. Crazy for Tea: Are Green Tea Side Effects Something To Worry About? Health Castle: Is Lipton Iced Green Tea actually tea?